At New Life Scientific, we tested this tissue processor by putting it through actual processing functions in manual and programmed modes, including pumping fluids, heating the oven and retort, and draining fluids. We also calibrated the oven and retort so temperatures are read accurately. After testing, we flush the system with alcohol to clean the lines for storage. With our 90-day warranty covering you from any unforeseen problems, this processor is ready for more years of dependable service in your lab. New Life Scientific sells and services tissue processors manufactured by Sakura, Leica, and Thermo. Even after your warranty expires, New Life Scientific can provide support and parts to keep your instrument running! 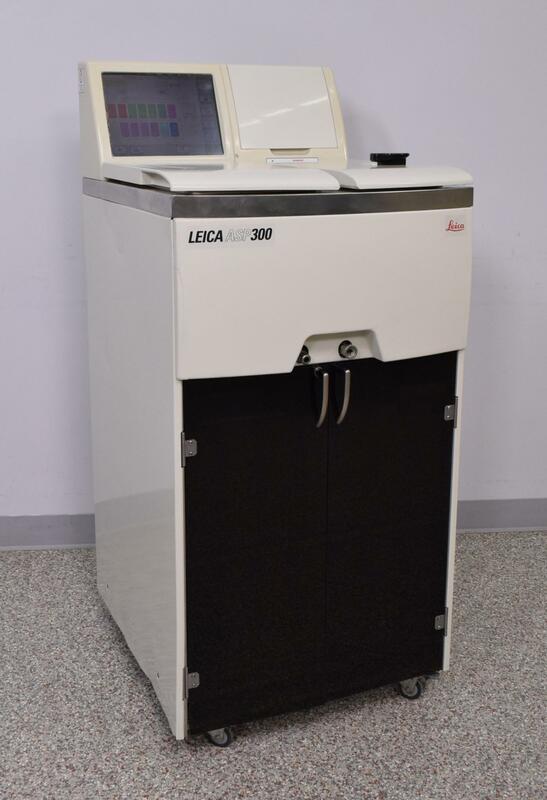 Our in-house technician inspected and tested this Leica ASP300 Enclosed Tissue Processor, confirming it to be fully functional. Technician tested the processor by running water through the system and into the reagent bottles. Afterwards alcohol was ran through to dry out any lingering water. The screen and different menus are all responsive.